Join my list. Enter your email below and hit enter. Beauty of the Beast Series Go below to download "FREE" ebook form places like Amazon, Google, Apple, Barnes and Noble, and Kobo. 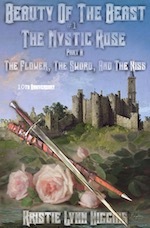 Pick from the "NEW" 10th Anniversary Edition (10th) and/or Original Cover edition (BOTB1A) and click on the link below to read Beauty Of The Beast #1 The Mystic Rose: Part A: The Flower, The Sword, And The Kiss. Most stores have the first book listed for "FREE". Look for the (F) for FREE ebooks. Ebooks available at Amazon, Barnes and Nobel, Apple iTunes iBooks, Google, and a few others. Synopsis: A new approach to the classic fairy tale. The story of Beauty and the Beast with a twist. What if the woman was the one turned into the creature? A realm of adventure and peril mingled with romance, friendship, and sword and sorcery. Join Pluck as she travels through a strange land of danger and intrigue as she finds allies and foes alike in her search to lift her monstrous curse. A story like Beauty and the Beast but with more action and menacing darkness. On the planet Terra when recorded history began, Man coexisted with the Necroms. Necroms were intelligent catlike humanoids. The dawn of this period was known as the First Age of Magic. In the Second Age of Magic, a war broke out between Man and the Necroms and by the middle of the Second Age, Man was nearly wiped from creation. Those who survived fled Wellspring and journeyed across the sea into the unknown, finding new homes and creating fortified domains. In the Third and final Age of Magic, Man established five island kingdoms: Commery, Fletching, Morgog, Swelldom, and Hort. In the First Age of Metal, Man turned from the lost art of magic to the might of weapons as they discovered iron then steel. Large armies were created, and Man fought amongst themselves, forgetting the Necroms into myth. For generations, the wars continued until an arranged marriage between the two strongest kingdoms of Commery and Morgog ceased the bloodshed, and so Man established the first Emperor and Empress and the tradition of Amalgamation. When both the Emperor and Empress of the Five Kingdoms died, the two strongest kingdoms' heirs married and crowned a new dynasty, and so began the Age of Amalgamation. During this age, a witch placed a curse on a girl named Pluck. The curse had been meant for a boy, Prince Edward of Fletching, for stealing the Mystic Rose. Pluck transformed into a Necrom with the Kiss, Edward's first kiss as her only redemption. The Kiss wouldn't be an easy task since showing her face meant her death. “Read free sample chapter below” & then download entire scifi novel for FREE. A twist to the classic Beauty and the Beast fairy tale. What if the woman was the one turned into the creature? Journey with Pluck as she tries to break her curse and find her place in the world. On the planet Terra when recorded history began, Man coexisted with the Necroms. Necroms were intelligent cat-like humanoids. The dawn of this period was known as the First Age of Magic. In the Second Age of Magic, a war broke out between Man and the Necroms and by the middle of the Second Age, Man was nearly wiped from creation. Those who survived fled Wellspring and journeyed across the sea into the unknown, finding new homes and creating fortified domains. In the Third and final Age of Magic, Man established five island kingdoms: Commery, Fletching, Morgog, Swelldom, and Hort. In the First Age of Metal, Man turned from the lost art of magic to the might of weapons as they discovered iron then steel. Large armies were created, and Man fought amongst themselves, forgetting the Necroms into myth. For generations, the wars continued until an arranged marriage between the two strongest kingdoms of Commery and Morgog ceased the bloodshed, and so Man established the first Emperor and Empress and the tradition of Amalgamation. When both the Emperor and Empress of the Five Kingdoms died, the two strongest kingdoms' heirs married and crowned a new dynasty and so began the Age of Amalgamation. "Stand your guard!" Han shouted as he held a wooden sword, taking an attack position against a boy. The commander's red cape draped his left shoulder, and he had short black hair and a trimmed beard. He told the boy, "I shall attack first." Blue-gray hills surrounded them as a cool crisp breeze swept through the tall grass. The multitude of knee-high blades rippled like waves across an ocean. Edward drew his wooden sword, taking a defensive position. He stood by a large Cobalt Oak in the land of Naught. The silver-blue tree shaded them as a Crimson Jay chirped to the new sun's cycle. Edward said, "I am ready, High Guard." Five more High Guards surrounded a carriage, watching the fight, and they cheered on the boy prince as a carriage driver tended to four horses. The steeds needed water before the last stretch of their journey back to the Fletching Kingdom. The journey to anoint the Prince a potential Emperor was over. A little girl with an open book watched the practice duel. "Quiz me," she pleaded to one of the guards. Von took the book, asking, "What is a nal?" She smiled, smoothed her hands down her plain brown dress, and then answered, "A nal is a measure of time. There are twenty in a day; it's what we call a sun's cycle." "Good..." Von replied as he glanced up and noticed Han was ready to begin, so he hurried the next question by asking, "What is a mite?" She giggled and then answered, "A nal consists of a hundred mites; it also measures time." She beamed with pride, knowing the next fact as she said, "There are two thousand mites in a sun's cycle." "Well done," Von said. "What is a zoc?" "It measures distance. A horse can run a zoc in six mites." "Good, good..." he said as he handed the book back, turning his full attention to the Prince and commander. "Let us watch the duel." Han thrust his small wooden sword, and Edward blocked. "Excellent," the commander told Edward. "Now we need to work on countering." Han repeated the attack, and Edward blocked and thrust toward the Guard's belly. Han blocked and stripped the Prince of his sword, and the weapon fell near the carriage. "Never believe you have the upper hand," Han told him as his face hardened for the sake of the lesson. Edward was so much like his father the King. He was so arrogant and fallibly confident. He wasn't cruel but self-centered. The commander hoped his future King would be a good ruler and one with a heart for the people. Han stated, "If you let up your guard in the least, your enemy shall take advantage." The Prince bowed his head in defeat. He hated losing. Edward spoke, "I do not see why I have to practice the sword." Han sighed and then said, "You must learn to defend yourself, my lord." He leveled his blade on the Prince as he added, "You must be able to protect yourself." The little girl gasped, dropped her book, ran to Edward's sword, and picked it up. She ran behind Han, jumped on his back, and placed the wooden blade next to his neck, and then the girl declared, "Not as long as there are High Guards to protect him." Han laughed, and then he questioned her, "So little one, are you a High Guard?" "Yes," she answered. He grabbed the sword and rolled her off his back into his arms. Edward kicked the dirt jealous that Han's attention was on the girl, and then he said, "Girls cannot be High Guards. Girls are not allowed to handle weapons." Han put the child down and looked her over, and then he told her, "You know the Prince is right, little one. What's your name?" She admired the man towering over her as she answered him, "I've only been called girl. I'm–"
"The peasant was never given a name," Edward interrupted, looking down on the girl. "Her mother died when she was born, and she has no father and so has no name. My mother the Queen took pity on her and made her my playmate." Han rubbed his black beard, examining her, and then he questioned, "You are what, eight?" "Nine," she replied. "Two seasons younger than the Prince." "Why haven't you picked yourself a name?" the commander questioned. She batted her big brown eyes as she replied, "I don't know what to call myself. I was also told only someone from the court can name me." Han glanced over those gathered, focused on one of his men who was an Archer, and grinned. He questioned her, "How about Pluck?" "Pluck is not a girl's name," Edward stated as he sneered, wondering why the commander never picked a name for him. He was the Prince and was far more worthy to receive a name. Edward said, "Anyway, is that not the heart, liver, and lungs of a slaughtered animal? Why not call her Entrails?" Han frowned, shaking his head as he spoke, "Never mind the Prince; he can be spiteful when he loses a duel." The commander turned his gaze back to the girl. A name was very important; it identified who you were, who you could be and once given, no one could take it away. Han told her, "Pluck also means resourceful courage and daring in the face of adversity." She smiled as she said, "I like Pluck." She delighted in how the word rolled off her tongue and that it was something that belonged to her. "But Pluck is not a girl's name," Edward insisted, stomping his foot. "It is not proper." "True... True..." Han spoke as he looked at the girl. The Prince was right, the name wouldn't be accepted in the Fletching Court. Han suggested, "Perhaps I should pick another." "No. I like it," she said as she pleaded with her small hands, fearing he would take it away before it was hers. "Really, I like Pluck. Please, let me keep it. Something that's mine." Han's face softened. The poor child... to have nothing in this world, not even a name. He raised his wooden sword, tapped her on each shoulder as if knighting her, and said, "Pluck it is." Edward rolled his blue eyes as he asked, "How much longer until we leave?" Han looked at the carriage driver. The driver replied, "If we're to ride nonstop to the castle, the horses should rest a few more nals." "We shall wait a few more nals," Han stated, scanned the prairie, and then he questioned, "Why don't you play, my lord? It isn't every sun's cycle you're allowed beyond the walls of your castle." Edward's pout vanished as he started, "Well..." He looked over the blue-gray hills and saw a forest in the distance as a mischievous grin crossed his face. "I could busy myself for a nal or two." "Good then. Stay where we can see you and don't go into the forest," Han instructed him, then turned to his men, and ordered, "Bulwark and Von, keep an eye on the children. The rest of us shall ride ahead to the village and pick up our supper. We shall be back within the nal." "Yes, sir," Bulwark and Von replied. "This way," Edward commanded the girl as he scurried through the tall blue-gray grass as if chasing something. "I saw a Prairie Toad. Let us see if we can catch it." "Where?" Pluck asked as she ran after him, carrying the Prince's wooden sword. "I don't see a toad." "There!" Edward shouted as he pointed at the imaginary amphibian. He needed to get them closer to the forest and then wait till the Guards were not looking. He glanced at the girl. All he had to do was convince her to follow him. He smirked. She was very devoted to him; it might not be as hard as he believed. He told her, "The toad is heading into the forest." She stopped and shook her head as she insisted, "We can't. Han said we're not to go in." Edward also stopped and spoke, "He did, but who is the Prince?" He raised his chin to show his authority and said, "Anyway..." A sly grin crossed his face before he stated, "I shall need a Guard to accompany me." Pluck's face brightened as she pointed to herself and questioned, "You mean me?" She motioned back the way they came and asked, "But what about Bulwark and Von?" The children looked across the prairie to the warriors. The two High Guards were distracted by a traveler asking directions. "We shall not be gone long. They shall not even know we are missing so come," Edward commanded her as he headed into the forest. "It shall be an adventure like those told in stories." "I don't know," she said as she followed him, searching the trees. "What if Necroms live here?" "Necroms..." He laughed and then explained to her, "They are only stories told to scare little children." "I am a child..." Pluck stated as she apprehensively scanned the forest, gripping the sword tightly. "I am scared." She bit her lip, not wanting to go but did, desperate to protect the Prince no matter how frightened she was. Pluck said, "There are reasons children shouldn't go into dark woods." Summer green shrouded the forest as Black Feathered Yaws sang to the new sun's cycle. Their high pitched shrills echoed across the forest as pine scented the air. Trunk Beetles buzzed about the children as Edward led them down an animal trail. The canopy thickened the further they ventured. The woods darkened as the sun found little passage into the forest domain, and the air grew cool. "We better go back," Pluck suggested as she searched the shadows for monsters as misshapen trees frightened her. "Are you afraid?" Edward questioned as his heart pounded for the excitement, knowing nothing would turn him back. "Yes," she admitted. "Please, let's return." "A little farther then we shall. Look..." He pointed to a structure hidden in the vegetation and asked, "What could it be?" "A temple? Maybe..." Pluck replied as she saw statues of a Woolly Tiger, Fire Lion, Striped Cheetah, and Ghost Panther guarding the overgrown entrance. Their cold stone eyes glared at them, warning them not to enter as she stated, "I don't think we should go in." "Nonsense. There is nothing to be afraid of. There is no one else out here." "That's why I'm afraid," she admitted as her little hands trembled. Pluck readied the wooden sword as she said, "I'm the only one here to protect you." In the distance, Bulwark and Von shouted, "My lord... Prince Edward..." Their cries were frantic as they questioned, "Where are you?" Pluck started to shout. "No," Edward commanded, staring at the temple that beckoned him. "I am not done with my adventure. They shall find us when they do. Come." "I think we should let them know where we are." Edward turned to her, and his piercing blue eyes stared at her as he asked her, "Do you love me?" His question surprised her, so she didn't answer. "Do you love me?" he repeated. "Then come with me," Edward interrupted, feeling nothing for her. She was an object; the girl was something to own and something to rule. He attacked her heart; it was the one muscle vulnerable to words... to lies... A simple gesture from him and then a smile, and she was his. His mother had taught him well. He told her, "If you love me, you shall do as I say." Pluck didn't answer him only nodded. Edward rushed into the structure, following a long pale-white hallway. Brass torches lit the stone passage that looked as if it hadn't been used in a very long time. "Someone is here," she said. Everything within Pluck told her to run and flee from this place. She told him, "Someone had to light the fires." "Let us see," Edward said as he steadied himself on a cold stone wall determined to continue. The temple had to protect something, and he had to know what it was. Edward told the girl, "This is my kingdom and anyone here is my subject." Pluck bit her lip again, and then she said, "That doesn't mean they'll obey you." The hall opened to a large room with a round blue pool. Steam hovered above the water like a ghostly mist. A bush grew from a platform in the middle of the water and on it, a single white flower budded. Edward's eyes widened as he uttered, "A Mystic Rose!" "A what?" Pluck inquired and when she saw it, the flower's beauty awed her. "A Mystic Rose. It is written they possess great power," Edward spoke as he licked his lips greedily and deeply breathed, smelling the flower's sweet aroma. "It is said the Rose was the only magical thing brought to the Fletching Kingdom." He rubbed his palms as he stated, "I must have it." "Maybe you shouldn't. It belongs to someone," Pluck insisted as she noticed more statues of large cats encircling the room. "Please, let's leave." "I am the Prince. What I want I possess," Edward declared as he crossed stone steps to the bush. Glittering sparkles surrounded the Rose like fluttering pixies. He carefully grabbed the stem of the white Rose, broke it from the bush, then waited a couple of moments to see if anything would happen, and headed back. Edward said, "See... Nothing... Now let us return." Pluck looked around as she held her breath, and then she sighed and studied the Rose as she asked, "May I touch the Rose?" He thought on her request, and then he replied, "You may but only once." She touched the white petals of the Rose with her left hand and slid her index finger down its stem. "That is enough," Edward spoke as he pulled it away. "Ouch..." Pluck said as she put her finger to her mouth. "The flower bit me." "Huh?" He examined the stem, and then he told her, "It did not bite you. You caught your finger on a thorn. See..." Edward showed her as he said, "There is a little blood here." The thorn absorbed the blood as she looked at it. The Rose's petals changed from white to blue. Pluck smiled and giggled, and the Rose's petals turned yellow. "How pretty," she uttered as she looked at her index finger, and her eyes widened as magical sparkles materialized. The multicolor lights danced about like fairies, and a black dot appeared on her fingertip. Two black lines shot from the circle and split, curving around to the top. The lines joined and created four separate rings up to her knuckle, and then the sparkles faded. Pluck questioned, "Is this magic?" "No..." Edward answered her and then said, "It looks like a tattoo. Do you not know magic happens only for those with Royal Blood?" He examined the markings. No peasant would receive the power of his Rose. He told her, "The Queen shall not like that you have a tattoo." Her faced reddened with embarrassment and fear, dreading the Queen's wrath, and then she said, "It's your fault I have it. You're the one who stuck me with the thorn." "My fault?" he questioned, and then told her, "Do not blame this on me." Pluck pouted as she said, "I am, and I'm going to tell the Queen." "My mother!" Edward uttered as he cringed. "You cannot. I command you not to." Her face grew stern as she spoke, "You'll have to do better than that." Her disobedience outraged him as he questioned her, "What did you say?" She folded her arms and then replied, "I want something for my silence." "Give you something, hah!" He looked at the yellow Rose and told her, "I shall not give you the Mystic Rose." Pluck laughed as she said, "I don't want it. I want something else." "What could you want?" Edward questioned as he looked around the room as if it would be there. She blushed, before whispering, "The Kiss." The Rose's petals changed to pink. Edward's face flushed as he uttered, "My first Kiss... but that is for my betrothed." He looked her over like she was rabble before he told her, "Anyway, you are not royalty." "That's true, but the Kiss only pledges your heart to the one," Pluck said as she giggled. "Not that you'll marry me. I know you can't marry a peasant." She fiddled with the wooden sword as she stated, "This is all I want." He thought on her proposal. The Kiss was meaningless to him. If it shall buy her silence... He answered, "Agreed. I shall give you my first Kiss and in exchange, you shall not tell my mother it is my fault you have the tattoo." He then added, "Or that I gave you the Kiss." "I agree," she said as she blushed again coyly. "I'll ready myself." Pluck placed her hands behind her back and puckered her lips. Edward took a deep breath, gathered his courage, and leaned toward her lips ready to meet them. Before they kissed, a howling wind whipped in, chilled the air, and flickered the fires lighting the room. The docile stone faces of the statues magically became angry, and the children heard large cats rage. The Rose's hue became purple as fear filled Pluck. "Who dares?" a woman's voice demanded like the roar of a lioness. "Who dares steal the Mystic Rose?" A woman fair as an Angel Dove soared into the room like a white apparition. She pointed a slender finger at the Prince as she questioned him, "Is it ye?" "Speak up child!" the woman demanded. "Is it ye?" Edward looked at Pluck, and then he stepped forward, replying, "Yes. I took the Mystic Rose." His fear turned to anger as he declared, "This is my kingdom, I shall take what I want." "Curse ye, arrogant one!" she shrieked. "Ye shall regret the sun's cycle ye transgressed this temple." She floated above them as she questioned them, "Do ye not know I am Fairah, Protector of the Rose? Curse ye! If ye had only asked, the Rose would have been ye's." Fairah hovered to the ceiling as green currents of electricity surged across her body. Her long white hair stood on end as power flowed through her ghostly form as she yelled, "Ye do not deserve the Rose!" "My Prince," a voice shouted from outside the structure. "Han, here!" Edward replied, hoping his guards would save him. "I am in danger!" Fairah raised her hands, forming a ball of electricity in her palms as her solid white eyes glowed green. She told him, "They shall not reach ye in time." She flung the energy, and the ball hurled toward him. Pluck's heart skipped, seeing Edward in danger, and she shouted, "My lord!" She rushed toward him and pushed the Prince out of the way as she yelled, "Look out!" Edward landed on the stone floor and rolled to face Pluck as the energy hit her, throwing her back, but she didn't fall. The power lifted her into the air like a great wind. She screamed as green electricity surged through her tiny body, whipping her brown hair about. Roars of Woolly Tigers, Fire Lions, Striped Cheetahs, and Ghost Panthers filled the room with unbearable noise. Edward covered his ears. A turquoise energy exploded from Pluck, blowing the Prince's black hair. The power shredded her dress, ripping it from her body, and she covered her nakedness with her arms and knees. "I'm burning!" Pluck shrieked, reaching her hand toward the Prince. "Save me!" Paralyzed by fear, Edward shook his head as he covered his eyes with his hands and screamed, "Make it stop! Han, save me!" Short beige fur sprouted from Pluck's body as a long tail formed. Tiger like claws replaced her nails and her canine teeth lengthened. Pluck screamed again, but she sounded like a Ghost Panther. Her hair changed to fiery-crimson and grew longer into a full mane. Her eyes changed from brown to emerald green, and her legs grew, becoming more cheetah like. The power lowered Pluck's small frame to the floor. She wept, wrapping her furry arms around her ill-fated form and shivered as tears streamed down her face. Edward scurried away from the ghastly sight, making Pluck cry all the more. Han, Bulwark, Von, and the rest of the Guards rushed in with their rapier swords readied. Bulwark and Von hurried to the Prince and carried him out of the temple as Han rushed toward Pluck, and then he halted. "By Fletching! What beast is this?" He lifted his sword to strike her as he yelled, "Crell spawn!" "Do not hurt the child," Fairah commanded. "She is only cursed." "She?" Han lowered his sword, examining the beast more closely as he inquired, "Is that you, little one?" Pluck turned to him, furry beige face wet with tears and quivered out an answer, "Yes." Han pointed his slender sword at the apparition and asked, "Is it a fight you want, witch?" "No," Fairah replied, and then she told him, "My duty 'tis over. Ye may leave in peace." Han turned to the men who were still with him and ordered them, "All of you out." They did as commanded, and he removed his red cape, covering Pluck, and then ordered the woman, "Change her back." His request surprised Fairah, and she told him, "I cannot as I said, there is a spell on her." "Why did you do this?" he demanded. "Why this hideous form?" "The punishment was meant for the boy, but she pushed him out of the way." "But why?" Han repeated. Fairah couldn't understand why this man didn't know. All of Fletching should know. Fairah answered him, "He stole the Mystic Rose which I am the protector of." She motioned to the bush in the center of the pool and said, "They should have known better." "Known?" Han snapped, and then he questioned, "Who are you?" Again he surprised her as she asked, "Ye do not know me? I am Fairah and this last place of magic has been protected by the king's decree since the foundation of the Kingdom." "My dear lady, I am Han, Commander of the High Guards," he said as he swiped his sword, pointing to the room. "I have not heard that this land is protected. You must have been forgotten by the passing of time." "I have been forgotten?" Fairah uttered as she contemplated the possibility. "Then the boy knew not to take the Rose or that in asking he could have had it." "So I punished him for only being an arrogant child." Fairah looked at Pluck with compassion as she restated, "Or should I say, I condemned her." Han demanded, "Take back the hex." She explained to him, "Even with my powers, I cannot but..." Fairah floated down next to the girl as she said, "There is a way." She waved her hand over the child and spoke, "If she can receive what was promised this sun's cycle before the Mystic Rose, the curse shall be broken." She lifted into the air as her ghostly form vanished slowly. She paused mid-air and told him, "There is nothing more for me to guard here till another Rose blooms." "What about the child?" Han asked as he felt helpless to comfort Pluck yet alone help her through this tragedy. "I cannot take her back to the castle like this. Since our birth, we are told to fear Necroms. We are to despise and kill any we might come across. Look at her." He turned Pluck to face Fairah, and then he continued, "She's the very embodiment of what we hate. I understand, but the others shall not. They shall throw her into the dungeon or kill her." Fairah shook her head with disdain as she said, "This is how they praise heroes now?" She looked around the Temple and then replied, "The child may live here. Few people venture into these woods, so she should be safe." Fairah looked once more to the girl as the tragedy of what she cursed her to became clearer in her mind, and then Fairah vanished without another word. "No," Pluck pleaded, turning to the High Guard. "Don't leave me here, not alone." Han felt for the girl. Her life had been hard enough but now with the curse... Han told her, "I am sorry, but you can't return with us. They shall not understand. Too many in the court still fear the myth of the Necroms." He left and returned, placing on the floor the supplies they purchased in town. "Here is some food," he stated, and then he started out. "No! Don't leave me." Pluck grabbed his leg as she begged him, "I don't want to be alone." Han's heart broke as he placed his hand on her furry head, and then he told her, "I vow as a High Guard I shall return tomorrow." He beckoned to her, so she would look to him, "Little one..."
She lifted her feline eyes. End sample “Download ebook for FREE.” Click below. Click above and download the free fantasy ebook and continue the story of Beauty of the Beast #1 The Mystic Rose: Part A: The Flower, The Sword, And The Kiss. Download from places like Amazon Kindle, Google Play Google Books, Barnes and Noble Nook, Apple Books iTunes iBooks, Kobo / Walmart ebooks. A new approach to the classic fairy tale. The story of Beauty and the Beast with a twist. What if the woman was the one turned into the creature? A realm of adventure and peril mingled with romance, friendship, and sword and sorcery. Join Pluck as she travels through a strange land of danger and intrigue as she finds allies and foes alike in her search to lift her monstrous curse. A story like Beauty and the Beast but with more action and menacing darkness. On the planet Terra when recorded history began, Man coexisted with the Necroms. Necroms were intelligent catlike humanoids. The dawn of this period was known as the First Age of Magic. In the Second Age of Magic, a war broke out between Man and the Necroms and by the middle of the Second Age, Man was nearly wiped from creation. Those who survived fled Wellspring and journeyed across the sea into the unknown, finding new homes and creating fortified domains. In the Third and final Age of Magic, Man established five island kingdoms: Commery, Fletching, Morgog, Swelldom, and Hort. In the First Age of Metal, Man turned from the lost art of magic to the might of weapons as they discovered iron then steel. Large armies were created, and Man fought amongst themselves, forgetting the Necroms into myth. For generations, the wars continued until an arranged marriage between the two strongest kingdoms of Commery and Morgog ceased the bloodshed, and so Man established the first Emperor and Empress and the tradition of Amalgamation. When both the Emperor and Empress of the Five Kingdoms died, the two strongest kingdoms' heirs married and crowned a new dynasty, and so began the Age of Amalgamation. During this age, a witch placed a curse on a girl named Pluck. The curse had been meant for a boy, Prince Edward of Fletching, for stealing the Mystic Rose. Pluck transformed into a Necrom with the Kiss, Edward's first kiss as her only redemption. The Kiss wouldn't be an easy task since showing her face meant her death. Beauty Of The Beast Epic Dark Fantasy Action Adventure Sword and Sorcery Novella Series: Beauty of the Beast #1 The Mystic Rose: 1. Part A: The Flower, The Sword, And The Kiss 2. Part B: A Vow Of Love And The Challenge 3. Part C: Hearts Betrayed And Blood Revealed www.kristielynnhiggins.com/BOTBSeries.html Beauty and the beast like stories. Beauty and the beast retellings 2019. Beauty and the beast retellings YA 2019. Beauty and the beast retellings young adult 2019. Free action packed version of Beauty and the Beast book. Sword and sorcery with a little romance novel to download for free. Book retellings. Fairy Tale retellings. Story retellings. Beauty and the Beast classic fairy tale. Beauty and the Beast novel adaptations. Beauty and the Beast YA novel adaptations. Beauty and the Beast young adult novel adaptations. Beauty and the Beast retellings for adults. Beauty and the Beast retellings for ya 2019. Beauty and the Beast retellings for young adults. Modern beauty and the beast. beauty and the beast different versions www.kristielynnhiggins.com/BOTBSeries.html Download for free from Amazon Kindle, Google Play Google Books, Barnes and Noble Nook, Apple Books iTunes iBooks, Kobo / Walmart ebooks. #Ilovefairytales #IloveBeautyAndTheBeast #Ilovedragons #Ilovebooks #Ilovefantasy #Ilovefantasybooks #Ilovereading #Ilovenovels #ILoveOnceUponATime #ILoveAdventures #ILoveActionAdventure #ILoveAdventureBooks #ILoveActionAdventureBooks #ILoveSwordAndSorcery #ILoveSwordAndSorceryBooks #ILoveLegends #BeautyAndTheBeast #TheRose #BeautyAndTheRose #BeautyBeast #BeautyAndBeast If you like young adult fiction or just fantasy in general, you love this series. A style close to young adult fiction. Free fantasy novel. Free fantasy book. Free fantasy story. Free samples of books. Free sample of ebook. Free sample of novel. Free samples of short stories. Writing that young adults can enjoy. Free young adult fantasy novel. Free young adult fantasy book. Free young adult fantasy story. Free samples of young adult books. Free sample of young adult ebook. Free sample of young adult novel. Free samples of young adult short stories. Free YA fantasy novel. Free YA fantasy book. Free YA fantasy story. Free samples of YA books. Free sample of YA ebook. Free sample of YA novel. Free samples of YA short stories. Free fairy tale novel. Free fairy tale book. Free fairy tale story. Free young adult fairy tale novel. Free young adult fairy tale book. Free young adult fairy tale story. Free YA fairy tale novel. Free YA fairy tale book. Free YA fairy tale story. Free dark fantasy novel. Free dark fantasy book. Free dark fantasy story. Free young adult dark fantasy novel. Free young adult dark fantasy book. Free young adult dark fantasy story. Free YA dark fantasy novel. Free YA dark fantasy book. Free YA dark fantasy story. Free epic fantasy novel. Free epic fantasy book. Free epic fantasy story. Free young adult epic fantasy novel. Free young adult epic fantasy book. Free young adult epic fantasy story. Free YA epic fantasy novel. Free YA epic fantasy book. Free YA epic fantasy story. Free fairytale fantasy novel. Free fairytale fantasy book. Free fairytale fantasy story. Free young adult fairytale fantasy novel. Free young adult fairytale fantasy book. Free young adult fairytale fantasy story. Free YA fairytale fantasy novel. Free YA fairytale fantasy book. Free YA fairytale fantasy story. Free high fantasy novel. Free high fantasy book. Free high fantasy story. Free young adult high fantasy novel. Free young adult high fantasy book. Free young adult high fantasy story. Free YA high fantasy novel. Free YA high fantasy book. Free YA high fantasy story. Free heroic fantasy novel. Free heroic fantasy book. Free heroic fantasy story. Free young adult heroic fantasy novel. Free young adult heroic fantasy book. Free young adult heroic fantasy story. Free YA heroic fantasy novel. Free YA heroic fantasy book. Free YA heroic fantasy story. Free Magical Realism novel. Free Magical Realism book. Free Magical Realism story. Free young adult Magical Realism novel. Free young adult Magical Realism book. Free young adult Magical Realism story. Free YA Magical Realism novel. Free YA Magical Realism book. Free YA Magical Realism story. Free Mythic Fiction Fantasy novel. Free Mythic Fiction Fantasy book. Free Mythic Fiction Fantasy story. Free young adult Mythic Fiction Fantasy novel. Free young adult Mythic Fiction Fantasy book. Free young adult Mythic Fiction Fantasy story. Free YA Mythic Fiction Fantasy novel. Free YA Mythic Fiction Fantasy book. Free YA Mythic Fiction Fantasy story. Beauty of the Beast #1 The Mystic Rose has elements of Romantic Fantasy. Free Romantic Fantasy novel. Free Romantic Fantasy book. Free Romantic Fantasy story. Free young adult Romantic Fantasy novel. Free young adult Romantic Fantasy book. Free young adult Romantic Fantasy story. Free YA Romantic Fantasy novel. Free YA Romantic Fantasy book. Free YA Romantic Fantasy story. Free Sword and Sorcery novel. Free Sword and Sorcery book. Free Sword and Sorcery story. Free young adult Sword and Sorcery novel. Free young adult Sword and Sorcery book. Free young adult Sword and Sorcery story. Free YA Sword and Sorcery novel. Free YA Sword and Sorcery book. Free YA Sword and Sorcery story. Free Supernatural novel. Free Supernatural book. Free Supernatural story. Free young adult Supernatural novel. Free young adult Supernatural book. Free young adult Supernatural story. Free YA Supernatural novel. Free YA Supernatural book. Free YA Supernatural story. Free Survival novel. Free Survival book. Free Survival story. Free young adult Survival novel. Free young adult Survival book. Free young adult Survival story. Free YA Survival novel. Free YA Survival book. Free YA Survival story. Free action adventure novel. Free action adventure book. Free action adventure story. Free young adult action adventure novel. Free young adult action adventure book. Free young adult-action adventure story. Free YA action adventure novel. Free YA action adventure book. Free YA action-adventure story. Free fairy tale novel. Free fairy tale book. Free fairy tale story. Free young adult fairy tale novel. Free young adult fairy tale book. Free young adult fairy tale story. Free YA fairy tale novel. Free YA fairy tale book. Free YA fairy tale story. Free young adult fairy tale action-adventure science fiction ebook. Free fairy tale novel. Free fairy tale short story. A young adult fairy tale book about friendship and curses. Follow Jane as she ventures through the World of Grimm where fairy tale characters come to life. Fans of the ABC TV series Once will love these stories. www.KristieLynnHiggins.com www.kristielynnhiggins.com/BOTBSeries.html Beauty of the Beast romance love story with fantasy action and adventure. Beauty of the Beast a fairy tale romance love story with sword and sorcery action. A fantasy romance story told with a twist. A fairy tale love story where hearts are torn and love is tested. Do you just love Beauty and the Beast? Check out this great action adventure story.